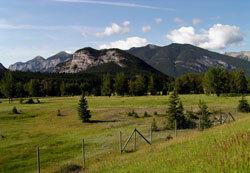 Named for: The mountain was named for the hot springs at its base. 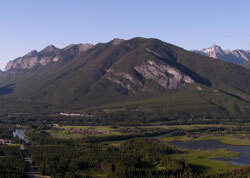 The full ten kilometre length of Sulphur Mountain, including Sanson Peak on its northern end, is visible from Whiskey Creek Meadows in the area of Banff Townsite (with the exception of the part hidden behind Tunnel Mountain) and from the Trans-Canada Highway from west of the townsite. Hardly an outstanding peak, Sulphur Mountain's claim to fame is the amount and variety of development which has occurred on its slopes and summits. 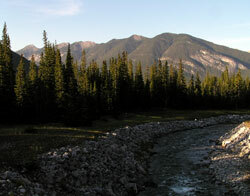 The hot springs which flow from its northeastern slopes are the source of its name and also prompted the creation of Banff National Park and the Canadian National Parks System. In 1875 two American fur hunters, Willard Younge and Benjamin Pease, spent a few weeks at Morley where the Natives told them of the springs and gave them directions. After noticing a plume of steam rising above the spruce trees, they became the first non-natives to visit the site. Ten years later, when it appeared that the springs were to be exploited by a trio of entrepreneurs, Prime Minister John A. Macdonald created the world?s third national park, not to protect the splendid natural environment which we think of today as Banff National Park, but rather so that, "proper control of the lands surrounding these springs may be vested in the Crown," and, "reserved from sale or settlement or squatting." 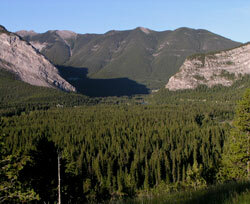 Today, the Sulphur Mountain Gondola takes visitors to the summit of the ridge from near the site of the hot springs. In 1903, what is now known as Sanson Peak was chosen as the site for a weather observation facility. Norman Sanson was a meteorologist and was associated with the Banff Museum form 1896 until 1931. As part of his duties he climbed the mountain every week or two, a large contingent of Banff residents accompanying him on his one thousandth trip in 1931. In 1945, at the age of 83, he climbed the mountain to observe a solar eclipse from his favourite location. In 1956 one of the more noticeable scars in Banff National Park was created by the construction of a road up the western slopes of Sulphur Mountain to the summit of Sanson Peak. The location had been chosen by the National Research Council as the site of a cosmic ray research station which was later taken over by the University of Calgary and operated until 1978. The mountain was referred to as Terrace Mountain on George Dawson's 1886 map. This may have had something to do with the fact that nearby Mount Rundle was briefly named Terrace Mountain in 1858 by James Hector.